The electric truck is zero emission and produces low noise making it suitable for indoor use. It features a fully sealed, weather-proof body protecting the machine’s driveline and other key components from the elements when working outdoors. It is powered by an 80-volt lead acid battery which can work a full eight-hour shift on a single charge. Batteries can be changed in around two minutes from the rear using a single point hoist or another lift truck. All machines are fitted with JCB LiveLink telematics system as standard to allowing real-time measurement of energy consumption and detailed analysis of machine utilisation. The electric Teletruk can climb a 21 per cent gradient or ramp and has a full free lift of 1575 mm as standard. 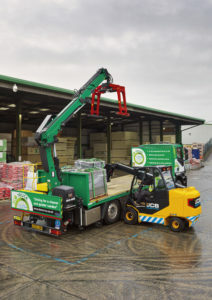 The truck features a side-mounted boom and has a lift capacity of 1900 kg at 2 metres with telescopic forward reach allowing palletised loads to be loaded to the far side of a curtainsided trailer. This enables it to access curtainsiders from only one side, meaning a curtainsider requires just six metres width of space within which to be loaded or unloaded. This can save up to 70 m sq of space per truck with single side loading. The electric Teletruk can also place a 1600kg load 3 metres into a van, making the most of extended wheel-base vehicles. The truck has load motion control as standard to prevent forward tip. This alerts the operator when reaching full lift or reach capacity with a green, amber, red light signal and will not allow a load to be used outside of the load capabilities. The cab is 2.2 metres high. All hydraulic functions, as well as direction and speed of travel, are controlled using a single joystick. Truck performance information such as battery life, speed and Load Motion Control is shown on an electronic display. The Teletruk has a 360˚ field of vision around the machine and to the attachment, 111 degrees of carriage rotation, and can turn within its own axis for even greater versatility. “We now have a machine that is capable of operating at optimum efficiency both inside and outside the warehouse, distribution centre or factory facility – delivering the ultimate in machine versatility,” said JCB industrial general manager Paul Murray.